Selling your property by public auction is easier than you think. We have developed a 4 step system in which we can successfully sell your property for it's maximum value. Step 1- We meet and set a date for your sell and decide where to place advertisements and fliers. At this time an auction agreement is signed and a time line developed. Step 2- High Hopes Auction does all the work! We shoot photos, write & place ads in newspapers, online, produce and mail fliers plus emails. We get your property grouped and ready for the sale. We show your property to perspective buyers during the preview. In short we do the work. 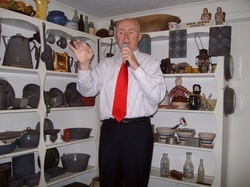 Step 3- AUCTION DAY, High Hopes will provide all help and conduct the auction in a Professional and Businesslike manner. Step 4- You receive a check and paperwork to properly account for the auction. It's that easy and we do the work! NO NEGOTIATIONS: There is no haggling over price or merchandise. The auction method is quick and efficient. When people bid they make a commitment to buy the property at that price without discussion or debate. NO LEFTOVERS AND LITTLE CLEAN UP: Every item at the auction goes up for bid and every item is sold. With an auction there is no worry about what to do with leftover items because there aren't any. This means very little clean up also. COMPETITIVE BIDDING: Auctions motivate buyers to perform. People get caught up in the competitiveness of the bidding and many times this drives the price of items higher. To some it's like a game and they want to win at all costs. Did you know that 9 times out of 10 an auction brings in the fair market value. If not more for any item put across the block?